Our April 2018 summary of global economic & financial market events. The market volatility that resurfaced in the first quarter of 2018 continued in April, with investor attention focused on a broad range of risks. Yet one threat that has seemingly eased is geopolitical tensions. Not long ago, concerns were focused on combative U.S. rhetoric toward the North Korean peninsula. Yet ultimately a war of words came to nothing, the PyeongChang Olympics provided a timely détente, and Kim Jong-un is currently engaging in diplomatic negotiations with key players including the U.S. and China. Another risk making recent headlines was the possibility of war between Saudi Arabia and Iran. This could have been calamitous from an oil shock perspective. While the countries are still battling for influence across the Middle East, the risk of direct confrontation has ebbed. Finally, Trump’s protectionist threats to pull up the drawbridge on trading partners like China and Mexico have evolved into extended tariff exemptions and flights to Beijing in order to build frameworks that all partners can live with. In all of this, a message worth remembering is that geopolitical threats rarely manifest. And even when they do, they seldom spill over into macroeconomic conditions or leave a lasting impact on global financial markets. Hence investing – or worse, divesting – a portfolio on the basis of geopolitical rhetoric is typically unsuitable. The Bank of Canada left interest rates unchanged in April. Although Canadian economic indicators continue to demonstrate strength – near-full employment, robust economic fundamentals, inflation hovering around the 2.0% target rate – the Bank is pursuing a cautious approach in the face of housing market risks, record debt levels, and NAFTA uncertainties. At this juncture it is unclear just how high and how quickly rates will rise. The global bond market’s primary benchmark, the 10-year U.S. Treasury yield, briefly knocked on a closely monitored door last month. The 3% mark was reached mainly due to expectations for stronger growth and inflation, but later retreated on news of weaker global economic data and easing geopolitical tensions. The psychologically significant 3% level has only been surpassed twice since 2011. Further rallying past this mark would be a headwind for risk assets, as it increases the cost of borrowing. 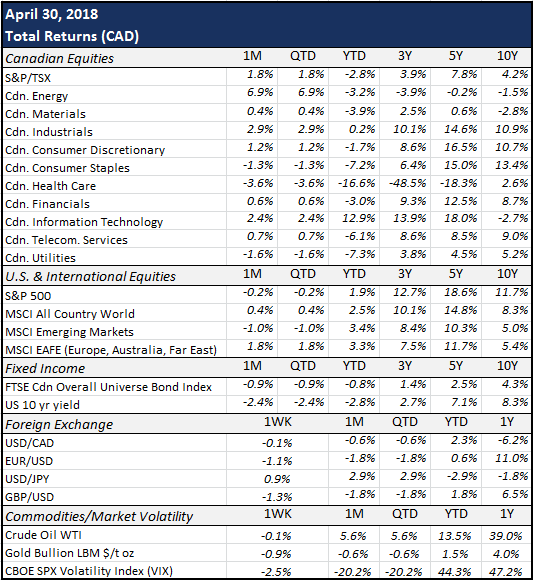 The FTSE Canada Bond Universe Index returned -0.9% in April. April stock market news was dominated by a highly impressive start to corporate earnings season. With the majority of S&P 500 companies already reported, 78% have beaten expectations. Nearly 80% of firms are ahead of EPS expectations by 9%, and 74% have beaten revenue expectations by 2%. Although equity markets struggled to find upside momentum in the first half of April, most managed to notch a positive month for the first time since January – the slew of positive U.S. tech firm earnings and marquee M&A deals particularly buoying investor sentiment. The TSX, S&P 500 and MSCI World Index returned 1.8%, -0.2% and 0.4% (CAD) respectively. Pundits postulate that the global equity outlook will depend on corporations’ abilities to beat earnings expectations for the rest of the year. This leaves little room for disappointment, especially in an environment of rising interest rates, borrowing costs and market volatility. But the good news is that corporate earnings still continue to improve. In currency markets, the U.S. dollar hit a four-month high in April before closing the month trading at 78 cents against the loonie. Easing geopolitical tensions and higher yields have enabled investors to focus on greenback-boosting fundamentals. The Canadian dollar outperformed most major currencies last month as oil prices rose and inflation data pointed to further interest rate hikes this year. In oil markets, prices rallied above three-year highs last month. The ascent was supported by a perception that tensions in the Middle East and crisis-hit Venezuela could lead to supply disruptions. Thanks to healthy demand and extended supply cuts, oil has been one of the top-performing commodities of 2018. Benchmark crude oil prices advanced 5.6% in April.